“Our lives will never be the same again, but in a good way,” I was talking to Jean on the phone the other day and we agreed about her precious grandson, CJ. Never the same again, but in a good way. He changed many lives forever in marked ways that make us somehow a little more Christ-like for having known him. It is with no sadness for CJ that we know he has a new address in heaven and is healed now, thanks be to God. But in our own pain and loss, we really wanted it to end differently. A little later today, I will take down the side banner that asked you to pray for CJ. I will never forget how CJ and his family’s faith encouraged a group of faithful prayer warriors, how His love poured from your hearts, how a picture of CJ with his hand reaching out toward heaven when he was just one day old touched my life. He made me more grateful, and he made me more aware that life is sacred and each moment to be enjoyed. It is with an overflowing heart of love and sadness that I thank you, Jean, especially for sharing your love story with us, to be privileged to pray with you and to hopefully make your burden a little lighter. I love you so, my friend. It still hurts, Lord. But all glory is yours in every event under heaven. By Your Grace alone, Amen. Would you listen with me one more time to CJ’s song, and give thanks. This entry was posted in Uncategorized and tagged God's grace by annette g. Bookmark the permalink. PS I loved the title of this post! May we all be “marked”! Annette, I just this minute saw this and, of course, cried through the song and these beautiful comments one more time. I should forget even putting on make up for awhile. 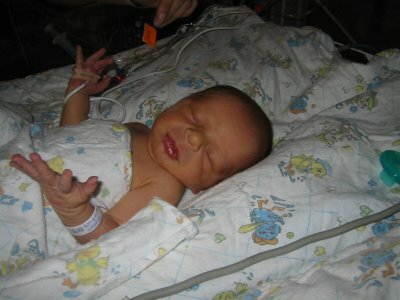 Seeing CJ’s 1 day old picture reminds me of the hopes and dreams we had for him. My most fervent hope and dream for all of my grandchildren is that they will know Jesus and now little CJ does …. in the most perfect and complete way. For that I can only sing praises to our Father who knows what is best. Again, my heart thanks you all so very much for uplifting our family in prayer. And, yes, Annette, is one of a small handful of the best friends God has ever brought into my life and how I thank Him for her. I cannot imagine what this journey would have looked like without her and all of you in it. Thank you, thank you, thank you. PS Annette, will you come fix my make up? Thank you Jesus for eternal life and for beautiful vessels here on Earth. Glory to God. Sharing their pain was to our benefit. I, too, pray they will heal – one never forgets but hopefully the pain eases and they find comfort with their beautiful memories. He, too, was a warrior! Annie, Jean- I feel so priviledged to have been a small part of CJ- even though I never held him, or even saw him. Praying for him, reading of the families struggles and needs, bonded my heart to all of you. It brings tears to my eyes to imagine the pain Jean- you are experiencing. The Lord’s grace is sufficient! The image of CJ running with the Lord, whole and complete, brings a joy in my heart and in my spirit- though I know we( you) will miss him dearly! Thank you Lord for the blessing that CJ is to us- Thank you for showing us- we truly can be a body of Christ- in spite our differences- You were a common bond! I never met CJ, but it does still hurt. His life and death advanced the Kingdom and brought glory to God. Through C.J. and his family (and friends), I learned what it really means to FROG…Fully Rely On God. Watching a family go through what the Myers’ went through, I am so grateful they had God in the center of it all. Even though I won’t see the button asking us to pray for CJ, know that I won’t forget to keep his wonderful family in my prayers for healing. Whenever I see a frog, I will remember that precious little boy. Thank you again, Jean for sharing your grandson and your faith with us. And… everyone should have a friend like Annette in their lives! Life changes and we’ll never be the same. Rejoicing with you over CJ’s freedom and yet aching for those he’s left behind. I AM thankful that He knows our name. That He wants to know our name. It has been tough watching (reading) about your going through this. I’m thankful Jean has a friend like you, and that in the body of Christ, we can share grief with an undercurrent of faith and even joy. It’s like a coin–one side, deep sadness, the other, deep joy. He is whole and happy and safe now. And you’ll meet him someday!